Hello to all 1960s to 1970s LHS Classmates! 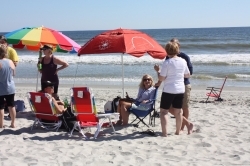 The Seventh Annual LHS 1960s to 1970s Class Reunion at Ocean Drive, SC is only seven months away! The Corn hole tournaments are in the works. If you want to compete, please secure your rights to play with an email to Wink Finger at winkf@charter.net. (This can also be noted on the registration page).This year’s tournament will be a Mixed Tournament with a Random Drawing for Pairings. There are cash prizes for the winners. For those that have signed up: When you check in for the reunion, Paula Turner will let you draw for your tournament position. Sign-ups for the tournament will end on Tuesday October 22 at Noon. The dates for the reunion are October 24-27, 2019. The place is Ocean Drive Resort. Please call OD Resort to make your reservations soon. Room Rates at the resort will be the same as they were last year. Call 1-843-249-1436 if you want to stay where the action is and be sure to tell them you are with the LHS group (Don’t use the 1-800 number as they won’t know about our group). Please remember the resort fee of $15.00 per day is added to your room costs. The cost to attend the event is still $50 per personif you register and pay before the event. If you pay at the door, cost is $60. No exceptions. We are always looking for reunion sponsors! If you or your company would like to send an extra donation as a sponsorship, we will recognize you in our booklet and at the reunion. If you have items for the Silent Auction, please let us know with an email to info@lhs60to70.com or contact Gail Mauney Little gmlit6@gmail.com and we will pick them up. We will be entertained by The Catalinas and DJ John Barkley. You will receive a coupon for a free breakfast at OD Café, plus some other treats. There will be free coffee, juice, & Krispy Kreme donuts in the Hospitality Room Thursday, Friday and Saturday mornings. Freeman’s Tax Service will be sponsoring the breakfast bar this year. Here is the schedule as we know it today. It will probably undergo some minor tweaking as the weeks progress. Please note time changes from previous years on some items. Enjoy meeting with your friends in the Hospitality Room ( Salon A & B)!! This will be limited to the first 12 people to sign up so if you are interested please send an email to slvalentine@hotmail.com. Steve will discuss with you what you need to bring with you concerning music, etc. There will be a 5 minute limit to each act. You can sing, dance, twirl baton, do magic, etc. Just keep it clean! Five judges will be selected randomly the night of the contest. 8:30 PM until... - DJ Johnny B spinning tunes from the 50s, 60s, and 70s. Be ready to dance!!! 7:30 AM to 7:00 PM - Salon A & B open for meet & greet. Adult beverages will be available at 9:00 AM. 9:30 AM - 10:30 AM – OD Beach Club Shag Basics with Linda and CB Wolfe. This will be a good exposure/refresher to Shagging. 10:00 AM to 3:00 PM - Silent Auction outside of Salon A & B.
CM Blume Jewelry will be for sale in Salon C on Friday and Saturday. Go visit Liz Miller Ostrow and Candy Miller Blume for some bling! 12:00 PM until it is done - Mixed "Corn Hole" round #1 on the Beach with Wink Finger & Randy Zimtbaum. 1:00 PM to 2:30 PM - Bingo in Salon B with June and Junior Loftin. Prizes sponsored by the Class of 1965. 3:00 PM - Pick up and pay for Silent Auction Items outside of Salon A & B. 4:00 PM to 6:00 PM – Shrimp Feast- Cost separate from registration – behind Fat Harold’s. Menu will be shrimp, corn on the cob and slaw. Tea/water will be available. Other beverages will be available inside Fat Harold’s at Happy Hour Prices. This evening has been left open for friends and family groups to get together. AND, we will offer entertainment at Fat Harold’s for those who are interested. 8:30 PM until.. - Entertainment at Fat Harold's from Johnny B in the back room. Take your badges! 11:00 AM to 12:15 PM - Pictures in the hospitality room. - meet in Salon B and your class will be called. These worked out so well last year that we decided to have them in the hospitality room again. 12:30 PM until it is done - Men and Women "Corn Hole" round #2 and Finals on the Beach with Wink Finger and Randy Zimtbaum. Dinner - Everyone is on their own-then head back for more Fun!! Turn in your badges - but be sure to keep your room key, breakfast tickets, etc.! Enjoy a free Breakfast in the OD Café one morning. Your ticket will be in your registration packet. Click on their website to learn about the band and hear their tunes..